Announcing the 2015 Spread The Love Expo! Perhaps I am mistaken about the intention, but it sounds like the fundraising is second to the shopping event. Perhaps one should consider that there are blogs out there that do not specifically blog about fashion or decorative items, but might still want to promote this event. Anyway.. I think it is better to give support, because the intention is right. Right? 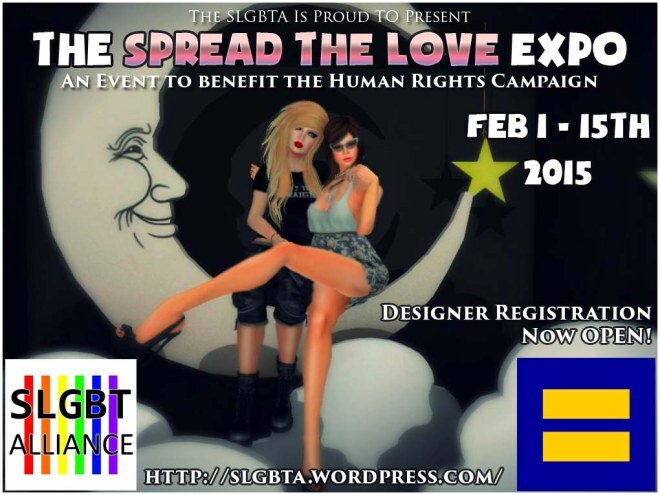 This Valentine’s Day, we invite you to join us for The Second Annual SLGBT Alliance Spread the Love Expo– a FULL SIM two-week shopping event and fundraiser. This year’s event will benefit The Human Rights Campaign Foundation. Shop for a good cause this season as 25 incredible designers come together with *New* and *Exclusive* Donation items to help benefit the Human Rights Campaign! What is the HRC Foundation?